This article is about the Australian metropolis. For the local government area, see City of Adelaide. 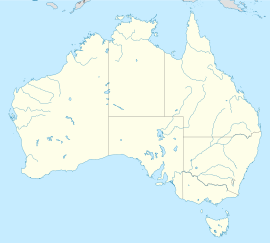 For other uses, see Adelaide (disambiguation). Adelaide (/ˈædəleɪd/ ( listen) AD-ə-layd) is the capital city of the state of South Australia, and the fifth-most populous city of Australia. In June 2017, Adelaide had an estimated resident population of 1,333,927. Adelaide is home to more than 75 percent of the South Australian population, making it the most centralised population of any state in Australia. Adelaide is north of the Fleurieu Peninsula, on the Adelaide Plains between the Gulf St Vincent and the low-lying Mount Lofty Ranges which surround the city. Adelaide stretches 20 km (12 mi) from the coast to the foothills, and 94 to 104 km (58 to 65 mi) from Gawler at its northern extent to Sellicks Beach in the south. Named in honour of Adelaide of Saxe-Meiningen, queen consort to King William IV, the city was founded in 1836 as the planned capital for a freely-settled British province in Australia. Colonel William Light, one of Adelaide's founding fathers, designed the city and chose its location close to the River Torrens, in the area originally inhabited by the Kaurna people. Light's design set out Adelaide in a grid layout, interspaced by wide boulevards and large public squares, and entirely surrounded by parklands. Early Adelaide was shaped by prosperity and wealth. Until the Second World War, it was Australia's third-largest city and one of the few Australian cities without a convict history. It has been noted for early examples of religious freedom, a commitment to political progressivism and civil liberties. It has been known as the "City of Churches" since the mid-19th century, referring to its diversity of faiths rather than the piety of its denizens. The demonym "Adelaidean" is used in reference to the city and its residents. As South Australia's seat of government and commercial centre, Adelaide is the site of many governmental and financial institutions. Most of these are concentrated in the city centre along the cultural boulevard of North Terrace, King William Street and in various districts of the metropolitan area. Today, Adelaide is noted for its many festivals and sporting events, its food and wine, its long beachfronts, and its large defence and manufacturing sectors. It ranks highly in terms of quality of life, being consistently listed in the world's top 10 most liveable cities, out of 140 cities worldwide by The Economist Intelligence Unit. It was also ranked the most liveable city in Australia by the Property Council of Australia in 2011, 2012 and 2013. Before its proclamation as a British settlement in 1836, the area around Adelaide was inhabited by the indigenous Kaurna Aboriginal nation (pronounced "Garner"). Kaurna culture and language were almost completely destroyed within a few decades of European settlement of South Australia, but extensive documentation by early missionaries and other researchers has enabled a modern revival of both. 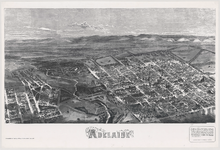 In July 1876, the Illustrated Sydney News published a special supplement that included an early aerial view of the City of Adelaide, the River Torrens and portion of North Adelaide from a point above Pennington Terrace, North Adelaide. South Australia was officially proclaimed a British colony on 28 December 1836, near The Old Gum Tree in what is now the suburb of Glenelg North. The event is commemorated in South Australia as Proclamation Day. The site of the colony's capital was surveyed and laid out by Colonel William Light, the first Surveyor-General of South Australia, through the design made by the architect George Strickland Kingston. Adelaide was established as a planned colony of free immigrants, promising civil liberties and freedom from religious persecution, based upon the ideas of Edward Gibbon Wakefield. Wakefield had read accounts of Australian settlement while in prison in London for attempting to abduct an heiress, and realised that the eastern colonies suffered from a lack of available labour, due to the practice of giving land grants to all arrivals. Wakefield's idea was for the Government to survey and sell the land at a rate that would maintain land values high enough to be unaffordable for labourers and journeymen. Funds raised from the sale of land were to be used to bring out working-class emigrants, who would have to work hard for the monied settlers to ever afford their own land. As a result of this policy, Adelaide does not share the convict settlement history of other Australian cities like Sydney, Melbourne, Brisbane and Hobart. As it was believed that in a colony of free settlers there would be little crime, no provision was made for a gaol in Colonel Light's 1837 plan. But by mid-1837 the South Australian Register was warning of escaped convicts from New South Wales and tenders for a temporary gaol were sought. Following a burglary, a murder, and two attempted murders in Adelaide during March 1838, Governor Hindmarsh created the South Australian Police Force (now the South Australia Police) in April 1838 under 21-year-old Henry Inman. The first sheriff, Samuel Smart, was wounded during a robbery, and on 2 May 1838 one of the offenders, Michael Magee, became the first person to be hanged in South Australia. William Baker Ashton was appointed governor of the temporary gaol in 1839, and in 1840 George Strickland Kingston was commissioned to design Adelaide's new gaol. Construction of Adelaide Gaol commenced in 1841. Adelaide's early history was marked by economic uncertainty and questionable leadership. [dubious – discuss] The first governor of South Australia, John Hindmarsh, clashed frequently with others, in particular the Resident Commissioner, James Hurtle Fisher. The rural area surrounding Adelaide was surveyed by Light in preparation to sell a total of over 405 km2 (156 sq mi) of land. Adelaide's early economy started to get on its feet in 1838 with the arrival of livestock from Victoria, New South Wales and Tasmania. Wool production provided an early basis for the South Australian economy. By 1860, wheat farms had been established from Encounter Bay in the south to Clare in the north. George Gawler took over from Hindmarsh in late 1838 and, despite being under orders from the Select Committee on South Australia in Britain not to undertake any public works, promptly oversaw construction of a governor's house, the Adelaide Gaol, police barracks, a hospital, a customs house and a wharf at Port Adelaide. Gawler was recalled and replaced by George Edward Grey in 1841. Grey slashed public expenditure against heavy opposition, although its impact was negligible at this point: silver was discovered in Glen Osmond that year, agriculture was well underway, and other mines sprung up all over the state, aiding Adelaide's commercial development. The city exported meat, wool, wine, fruit and wheat by the time Grey left in 1845, contrasting with a low point in 1842 when one-third of Adelaide houses were abandoned. Trade links with the rest of the Australian states were established after the Murray River was successfully navigated in 1853 by Francis Cadell, an Adelaide resident. South Australia became a self-governing colony in 1856 with the ratification of a new constitution by the British parliament. Secret ballots were introduced, and a bicameral parliament was elected on 9 March 1857, by which time 109,917 people lived in the province. In 1860 the Thorndon Park reservoir was opened, finally providing an alternative water source to the now turbid River Torrens. Gas street lighting was implemented in 1867, the University of Adelaide was founded in 1874, the South Australian Art Gallery opened in 1881 and the Happy Valley Reservoir opened in 1896. In the 1890s Australia was affected by a severe economic depression, ending a hectic era of land booms and tumultuous expansionism. Financial institutions in Melbourne and banks in Sydney closed. The national fertility rate fell and immigration was reduced to a trickle. The value of South Australia's exports nearly halved. Drought and poor harvests from 1884 compounded the problems, with some families leaving for Western Australia. 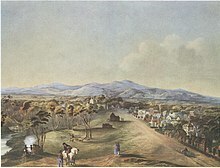 Adelaide was not as badly hit as the larger gold-rush cities of Sydney and Melbourne, and silver and lead discoveries at Broken Hill provided some relief. Only one year of deficit was recorded, but the price paid was retrenchments and lean public spending. Wine and copper were the only industries not to suffer a downturn. Electric street lighting was introduced in 1900 and electric trams were transporting passengers in 1909. 28,000 men were sent to fight in World War I. Historian F. W. Crowley examined the reports of visitors in the early 20th century, noting that "many visitors to Adelaide admired the foresighted planning of its founders", as well as pondering the riches of the young city. Adelaide enjoyed a postwar boom, entering a time of relative prosperity. Its population grew, and it became the third most populous metropolitan area in the country, after Sydney and Melbourne. Its prosperity was short-lived, with the return of droughts and the Great Depression of the 1930s. It later returned to fortune under strong government leadership. Secondary industries helped reduce the state's dependence on primary industries. World War II brought industrial stimulus and diversification to Adelaide under the Playford Government, which advocated Adelaide as a safe place for manufacturing due to its less vulnerable location. Shipbuilding was expanded at the nearby port of Whyalla. The South Australian Government in this period built on former wartime manufacturing industries. International manufacturers like General Motors Holden and Chrysler made use of these factories around Adelaide, completing its transformation from an agricultural service centre to a 20th-century city. The Mannum–Adelaide pipeline brought River Murray water to Adelaide in 1955 and an airport opened at West Beach in 1955. 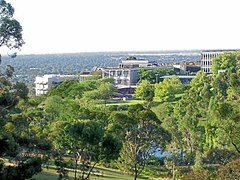 Flinders University and the Flinders Medical Centre were established in the 1960s at Bedford Park, south of the city. Today, Flinders Medical Centre is one of the largest teaching hospitals in South Australia. The Dunstan Governments of the 1970s saw something of an Adelaide 'cultural revival', establishing a wide array of social reforms. 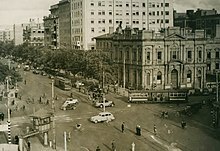 The city became a centre of the arts, building upon the biennial "Adelaide Festival of Arts" that commenced in 1960. Adelaide hosted the Formula One Australian Grand Prix between 1985 and 1996 on a street circuit in the city's east parklands; it moved to Melbourne in 1996. The State Bank collapsed in 1991 during an economic recession; the effects lasted until 2004, when Standard & Poor's reinstated South Australia's AAA credit rating. Since 1999, the Adelaide 500 Supercars race has made use of sections of the former Formula One circuit. Adelaide's tallest building, built in 1988, was originally known as the State Bank Building. In 1991 it was renamed the Santos Building and in 2006 it was renamed Westpac House, and it is currently the 160th tallest building in Australia. In the early years of the 21st century, a significant increase in the state government's spending on Adelaide's infrastructure occurred. The Rann government invested A$535 million in a major upgrade of the Adelaide Oval to enable Australian Football League to be played in the city centre and more than A$2 billion to build a new Royal Adelaide Hospital on land adjacent to the Adelaide Railway Station. The Glenelg tramline was extended through the city to Hindmarsh and the suburban railway line extended south to Seaford. 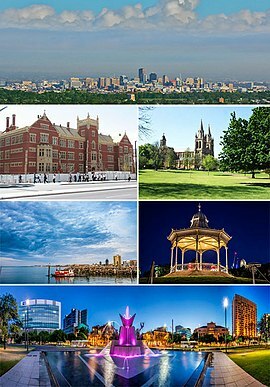 Following a period of stagnation in the 1990s and 2000s, Adelaide began several major developments and redevelopments. The Adelaide Convention Centre was redeveloped and expanded at a cost of A$350 million beginning in 2012. Three historic buildings were adapted for modern use: the Torrens Building in Victoria Square as the Adelaide campus for Carnegie Mellon University, University College London, and Torrens University; the Stock Exchange building as the Science Exchange of the Royal Institution Australia; and the Glenside Psychiatric Hospital as the Adelaide Studios of the SA Film Corporation. The government also invested more than A$2 billion to build a desalination plant, powered by renewable energy, as an 'insurance policy' against droughts affecting Adelaide's water supply. The Adelaide Festival, Fringe, and Womadelaide became annual events. Part of the CBD skyline at night, 2013: on the far left is Waymouth Street looking east, while the Town Hall clock tower is on the far right. City map of the Adelaide metropolitan area. Adelaide is north of the Fleurieu Peninsula, on the Adelaide Plains between the Gulf St Vincent and the low-lying Mount Lofty Ranges. The city stretches 20 km (12 mi) from the coast to the foothills, and 90 km (56 mi) from Gawler at its northern extent to Sellicks Beach in the south. According to the Regional Development Australia, an Australian government planning initiative, the "Adelaide Metropolitan Region" has a total land area of 870 km2 (340 sq mi), while a more expansive definition by the Australian Bureau of Statistics defines a "Greater Adelaide" statistical area totalling 3,257.7 km2 (1,257.8 sq mi). The city sits at an average elevation of 50 metres (160 ft) above sea level. Mount Lofty, east of the Adelaide metropolitan region in the Adelaide Hills at an elevation of 727 metres (2,385 ft), is the tallest point of the city and in the state south of Burra. Satellite image of Adelaide's metropolitan area. The Adelaide Hills is the green area to the right of the image. Much of Adelaide was bushland before British settlement, with some variation – sandhills, swamps and marshlands were prevalent around the coast. The loss of the sandhills to urban development had a particularly destructive effect on the coastline due to erosion. Where practical, the government has implemented programs to rebuild and vegetate sandhills at several of Adelaide's beachside suburbs. Much of the original vegetation has been cleared with what is left to be found in reserves such as the Cleland Conservation Park and Belair National Park. A number of creeks and rivers flow through the Adelaide region. The largest are the Torrens and Onkaparinga catchments. 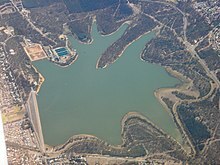 Adelaide relies on its many reservoirs for water supply with the Happy Valley Reservoir supplying around 40% and the much larger Mount Bold Reservoir 10% of Adelaide's domestic requirements respectively. Adelaide and its surrounding area is one of the most seismically active regions in Australia. On 1 March 1954 at 3:40 am Adelaide experienced its largest recorded earthquake to date, with the epicentre 12 km from the city centre at Darlington, and a reported magnitude of 5.6. There have been smaller earthquakes in 2010, 2011, 2014 and 2017. Adelaide is a planned city, designed by the first Surveyor-General of South Australia, Colonel William Light. His plan, now known as Light's Vision, arranged Adelaide in a grid, with five squares in the Adelaide city centre and a ring of parks, known as the Adelaide Parklands, surrounding it. Light's selection of the location for the city was initially unpopular with the early settlers, as well as South Australia's first governor, John Hindmarsh, due to its distance from the harbour at Port Adelaide, and the lack of fresh water there. Light successfully persisted with his choice of location against this initial opposition. The benefits of Light's design are numerous: Adelaide has had wide multi-lane roads from its beginning, an easily navigable cardinal direction grid layout and an expansive green ring around the city centre. There are two sets of ring roads in Adelaide that have resulted from the original design. The inner ring route (A21) borders the parklands, and the outer route (A3/A13/A16/A17) completely bypasses the inner city via (in clockwise order) Grand Junction Road, Hampstead Road, Ascot Avenue, Portrush Road, Cross Road and South Road. The corner of North Terrace (right) and Pulteney Street (left), looking south-west from Bonython Hall. Suburban expansion has to some extent outgrown Light's original plan. Numerous former outlying villages and "country towns", as well as the satellite city of Elizabeth, have been enveloped by its suburban sprawl. Expanding developments in the Adelaide Hills region led to the construction of the South Eastern Freeway to cope with growth, which has subsequently led to new developments and further improvements to that transport corridor. Similarly, the booming development in Adelaide's South led to the construction of the Southern Expressway. New roads are not the only transport infrastructure developed to cope with the urban growth. The O-Bahn Busway is an example of a unique solution to Tea Tree Gully's transport woes in the 1980s. The development of the nearby suburb of Golden Grove in the late 1980s is an example of well-thought-out urban planning. King William Street, one of the widest main streets in an Australian capital city, viewed from Victoria Square. In the 1960s, a Metropolitan Adelaide Transport Study Plan was proposed in order to cater for the future growth of the city. The plan involved the construction of freeways, expressways and the upgrade of certain aspects of the public transport system. The then premier Steele Hall approved many parts of the plan and the government went as far as purchasing land for the project. The later Labor government elected under Don Dunstan shelved the plan, but allowed the purchased land to remain vacant, should the future need for freeways arise. In 1980, the Liberal party won government and premier David Tonkin committed his government to selling off the land acquired for the MATS plan, ensuring that even when needs changed, the construction of most MATS-proposed freeways would be impractical. Some parts of this land have been used for transport, (e.g. the O-Bahn Busway and Southern Expressway), while most has been progressively subdivided for residential use. In 2008, the SA Government announced plans for a network of transport-oriented developments across the Adelaide metropolitan area and purchased a 10 hectare industrial site at Bowden for $52.5 million as the first of these developments. The site covers 102,478 square metres, or about 10 hectares, and is bounded by Park Terrace to the south, the Adelaide to Outer Harbour railway line to the west, Drayton Street to the north and Sixth and Seventh Streets to the east. Historically, Adelaide's suburban residential areas have been characterised by single-storey detached houses built on 1,000-square-metre (1⁄4-acre) blocks. A relative lack of suitable, locally-available timber for construction purposes led to the early development of a brick-making industry, as well as the use of stone, for houses and other buildings. By 1891 68% of houses were built of stone, 15% of timber, and 10% of brick, with brick also being widely used in stone houses for quoins, door and window surrounds, and chimneys and fireplaces. There is a wide variety in the styles of these predominately brick, and to a lesser degree, stone, and/or stone-faced, single-storey detached houses. After both of the World Wars, the use of red bricks was popular. In the 1960s, cream bricks became popular, and in the 1970s, deep red and brown bricks became popular. Until the 1970s, roofs tended to be clad with corrugated (iron) steel or clay tiles (usually red clay). Since then, cement tiles and Colorbond(R) corrugated (and other types of) steel have also become popular. Most roofs are pitched; flat roofs are not common. Up to the 1970s, the majority of houses were of "double brick" construction on concrete footings, with timber floors laid on joists supported by "dwarf walls". Due to Adelaide's reactive soils (particularly Keswick Clay, black earth and some red-brown earth soils), since then houses have mainly been constructed of "brick veneer" over a timber frame (and more recently, over a light steel frame) on a concrete slab foundation. The use of precast concrete panels for floor and wall construction has also increased. In addition to this, a significant factor in Adelaide's suburban history is the role of the South Australian Housing Trust. A spring storm over Adelaide. Adelaide has a Mediterranean climate (Köppen climate classification Csa), with warm to hot dry summers and cool to mild winters and with most precipitation falling in the winter months, leading to the suggestion that the climate be classified as a "cold monsoon". Adelaide receives enough annual precipitation to avoid Köppen's BSk (semi-arid climate) classification. Rainfall is unreliable, light and infrequent throughout summer. In contrast, the winter has fairly reliable rainfall with June being the wettest month of the year, averaging around 80 mm. Frosts are occasional, with the most notable occurrences in July 1908 and July 1982. Hail is also common in winter. Adelaide is a windy city with significant wind chill in winter, which makes the temperature seem colder than it actually is. Snowfall in the metropolitan area is extremely uncommon, although light and sporadic falls in the nearby hills and at Mount Lofty occur during winter. Dewpoints in the summer typically range from 8 to 10 °C (46 to 50 °F). There are usually two to three days in summer where the temperature reaches 39.0 °C (102.2 °F) or above, although the frequency of these temperatures has been increasing in recent years. The average sea temperature ranges from 13.7 °C (56.7 °F) in August to 21.2 °C (70.2 °F) in February. Adelaide, as the capital of South Australia, is the seat of the Government of South Australia. As Adelaide is South Australia's capital and most populous city, the State Government co-operates extensively with the City of Adelaide. In 2006, the Ministry for the City of Adelaide was created to facilitate the State Government's collaboration with the Adelaide City Council and the Lord Mayor to improve Adelaide's image. The State Parliament's Capital City Committee is also involved in the governance of the City of Adelaide, being primarily concerned with the planning of Adelaide's urban development and growth. Reflecting South Australia's status as Australia's most centralised state, Adelaide elects a substantial majority of the South Australian House of Assembly. Of the 47 seats in the chamber, 34 seats (three-quarters of the legislature) are based in Adelaide, and two rural seats include Adelaide suburbs. The Adelaide metropolitan area is divided between nineteen local government areas, including, at its centre, the City of Adelaide, which administers the Adelaide city centre, North Adelaide, and the surrounding Adelaide Parklands. It is the oldest municipal authority in Australia and was established in 1840, when Adelaide and Australia's first mayor, James Hurtle Fisher, was elected. From 1919 onwards, the City has had a Lord Mayor, the current being Lord Mayor The Right Honourable Sandy Verschoor. Compared with Australia's four other major state capitals, Adelaide is growing at a much slower rate. In 2017, it had a metropolitan population of more than 1,333,927, making it Australia's fifth-largest city. Some 77% of the population of South Australia are residents of the Adelaide metropolitan area, making South Australia one of the most centralised states. Major areas of population growth in recent years have been in outer suburbs such as Mawson Lakes and Golden Grove. Adelaide's inhabitants occupy 366,912 houses, 57,695 semi-detached, row terrace or town houses and 49,413 flats, units or apartments. About one sixth (17.1%) of the population had university qualifications. The number of Adelaideans with vocational qualifications (such as tradespersons) fell from 62.1% of the labour force in the 1991 census to 52.4% in the 2001 census. Overseas-born Adelaideans composed 29.8% of the total population. Suburbs including Newton, Payneham and Campbelltown in the east and Torrensville, West Lakes and Fulham to the west, have large Greek and Italian communities. The Italian consulate is located in the eastern suburb of Payneham. 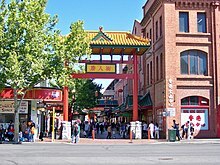 Large Vietnamese populations are settled in the north-western suburbs of Woodville, Kilkenny, Pennington, Mansfield Park and Athol Park and also Parafield Gardens and Pooraka in Adelaide's north. Migrants from India and Sri Lanka have settled into inner suburban areas of Adelaide including the inner northern suburbs of Blair Athol, Kilburn and Enfield and the inner southern suburbs of Plympton, Park Holme and Kurralta Park. Adelaide is ageing more rapidly than other Australian capital cities. More than a quarter (27.5%) of Adelaide's population is aged 55 years or older, in comparison to the national average of 25.6%. Adelaide has the lowest number of children (under-15-year-olds), who comprised 17.7% of the population, compared to the national average of 19.3%. Adelaide was founded on a vision of religious tolerance that attracted a wide variety of religious practitioners. This led to it being known as The City of Churches. But approximately 28% of the population expressed no religious affiliation in the 2011 Census, compared with the national average of 22.3%, making Adelaide one of Australia's least religious cities. Over half of the population of Adelaide identifies as Christian, with the largest denominations being Catholic (21.3%), Anglican (12.6%), Uniting Church (7.6%) and Eastern Orthodox (3.5%). The Jewish community of the city dates back to 1840. Eight years later, 58 Jews lived in the city. A synagogue was built in 1871, when 435 Jews lived in the city. Many took part in the city councils, such as Judah Moss Solomon (1852–66) and others after him. Three Jews have been elected to the position of city mayor. In 1968, the Jewish population of Adelaide numbered about 1,200; in 2001, according to the Australian census, 979 persons declared themselves to be Jewish by religion. In 2011, over 1,000 Jews were living in the city, operating an orthodox and a reform school, in addition to a virtual Jewish museum. The "Afghan" community in Australia first became established in the 1860s when camels and their Pathan, Punjabi, Baluchi and Sindhi handlers began to be used to open up settlement in the continent's arid interior. Until eventually superseded by the advent of the railways and motor vehicles, camels played an invaluable economic and social role in transporting heavy loads of goods to and from isolated settlements and mines. This is acknowledged by the name of The Ghan, the passenger train operating between Adelaide, Alice Springs, and Darwin. The Central Adelaide Mosque is regarded as Australia's oldest permanent mosque; an earlier mosque at Marree in northern South Australia, dating from 1861–62 and subsequently abandoned or demolished, has now been rebuilt. Flinders Medical Centre. Health care and social assistance is the largest ABS defined employment sector in South Australia. South Australia's largest employment sectors are health care and social assistance, surpassing manufacturing in SA as the largest employer since 2006–07. In 2009–10, manufacturing in SA had average annual employment of 83,700 persons compared with 103,300 for health care and social assistance. Health care and social assistance represented nearly 13% of the state average annual employment. The Adelaide Hills wine region is an iconic and viable economic region for both the state and country in terms of wine production and sale. The 2014 vintage is reported as consisting of 5,836 t (5,744 long tons; 6,433 short tons) red grapes crushed valued at A$8,196,142 and 12,037 t (11,847 long tons; 13,269 short tons) white grapes crushed valued at $14,777,631. The retail trade is the second largest employer in SA (2009–10), with 91,900 jobs, and 12 per cent of the state workforce. Manufacturing, defence technology, high-tech electronic systems and research, commodity export and corresponding service industries all play a role in the SA economy. Almost half of all cars produced in Australia were made in Adelaide at the General Motors Holden plant in Elizabeth. The site ceased operating in November 2017. The collapse of the State Bank in 1992 resulted in large levels of state public debt (as much as A$4 billion). The collapse meant that successive governments enacted lean budgets, cutting spending, which was a setback to the further economic development of the city and state. The debt has more recently been reduced with the State Government once again receiving a AAA+ Credit Rating. The global media conglomerate News Corporation was founded in, and until 2004 incorporated in, Adelaide and it is still considered its 'spiritual' home by Rupert Murdoch. Australia's largest oil company, Santos, prominent South Australian brewery, Coopers, and national retailer Harris Scarfe also call Adelaide their home. The Adelaide-built Collins-class submarine HMAS Rankin entering Pearl Harbor, August 2004. Adelaide is home to a large proportion of Australia's defence industries, which contribute over A$1 billion to South Australia's Gross State Product. The principal government military research institution, the Defence Science and Technology Organisation, and other defence technology organisations such as BAE Systems Australia and Lockheed Martin Australia, are north of Salisbury and west of Elizabeth in an area now called "Edinburgh Parks", adjacent to RAAF Base Edinburgh. Others, such as Saab Systems and Raytheon, are in or near Technology Park. ASC Pty Ltd, based in the industrial suburb of Osborne. South Australia was charged with constructing Australia's Collins class submarines and more recently the A$6 billion contract to construct the Royal Australian Navy's new air-warfare destroyers. As of November 2015[update], Greater Adelaide had an unemployment rate of 7.4% with a youth unemployment rate of 15%. The median weekly individual income for people aged 15 years and over was $447 per week in 2006, compared with $466 nationally. The median family income was $1,137 per week, compared with $1,171 nationally. Adelaide's housing and living costs are substantially lower than that of other Australian cities, with housing being notably cheaper. The median Adelaide house price is half that of Sydney and two-thirds that of Melbourne. The three-month trend unemployment rate to March 2007 was 6.2%. The Northern suburbs' unemployment rate is disproportionately higher than the other regions of Adelaide at 8.3%, while the East and South are lower than the Adelaide average at 4.9% and 5.0% respectively. Over the decade March 2001 – March 2010, Metropolitan Adelaide median house prices approximately tripled. (approx. 285% – approx. 11%p.a. compounding) In the five years March 2007 – March 2012, prices increased by approx. 27% – approx. 5%p.a. compounding. March 2012 – March 2017 saw a further increase of 19% – approx. 3.5%p.a. compounding. All numbers approximate and rounded. Since March 2012, the REISA no longer release a median house price for the Adelaide Metropolitan area, so figures retrieved are from Dept of the Premier and Cabinet. Each quarter, The Alternative and Direct Investment Securities Association (ADISA) publishes a list of median house sale prices by suburb and Local Government Area. (Previously, this was done by REISA) Due to the small sizes of many of Adelaide's suburbs, the low volumes of sales in these suburbs, and (over time) the huge variations in the numbers of sales in a suburb in a quarter, statistical analysis of "the most expensive suburb" is unreliable; the suburbs appearing in the "top 10 most expensive suburbs this quarter" list is constantly varying. Quarterly Reports for the last two years can be found on the REISA website. Education forms an increasingly important part of the city's economy, with the South Australian Government and educational institutions attempting to position Adelaide as "Australia's education hub" and marketing it as a "Learning City." The number of international students studying in Adelaide has increased rapidly in recent years to 30,726 in 2015, of which 1,824 were secondary school students. In addition to the city's existing institutions, foreign institutions have been attracted to set up campuses in order to increase its attractiveness as an education hub. Adelaide is the birthplace of three Nobel laureates, more than any other Australian city: physicist William Lawrence Bragg and pathologists Howard Florey and Robin Warren, all of whom completed secondary and tertiary education at St Peter's College and the University of Adelaide. At the level of primary and secondary education, there are two systems of school education. There is a public system operated by the South Australian Government and a private system of independent and Catholic schools. All schools provide education under the South Australian Certificate of Education (SACE) or, to a lesser extent, the International Baccalaureate (IB), with Adelaide having the highest number of IB schools in Australia. There are three public universities local to Adelaide, as well as one private university and three constituent colleges of foreign universities. Flinders University of South Australia, the University of Adelaide, the University of South Australia and Torrens University Australia—part of the Laureate International Universities are based in Adelaide. The University of Adelaide was ranked in the top 150 universities worldwide. Flinders ranked in the top 250 and Uni SA in the top 300. Torrens University Australia is part of an international network of over 70 higher education institutions in more than 30 countries worldwide. The historic Torrens Building in Victoria Square houses Carnegie Mellon University's Heinz College Australia, Cranfield University's Defence College of Management and Technology, and University College London's School of Energy and Resources (Australia), and constitute the city's international university precinct. 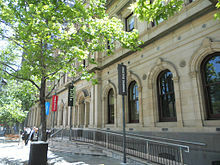 The University of Adelaide, with 25,000 students, is Australia's third-oldest university and a member of the leading "Group of Eight". It has five campuses throughout the state, including two in the city-centre, and a campus in Singapore. The University of South Australia, with 37,000 students, has two North Terrace campuses, three other campuses in the metropolitan area and campuses at Whyalla and Mount Gambier. Flinders University, with 25,184 domestic and international students, is in the southern suburb of Bedford Park, alongside the Flinders Medical Centre, another campus in neighbouring Tonsley, and maintains a small city campus in Victoria Square. The plaza on the Bedford Park campus was revamped in 2014 and officially re-opened in 2016. There are several South Australian TAFE (Technical and Further Education) campuses in the metropolitan area that provide a range of vocational education and training. The Adelaide College of the Arts, as a school of TAFE SA, provides nationally recognised training in visual and performing arts. The east end of North Terrace: IMVS; Hanson Institute; RAH; National Wine Centre. 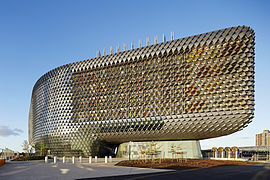 The west end of North Terrace: South Australian Health and Medical Research Institute (SAHMRI), located next to the new Royal Adelaide Hospital. The Waite Research Precinct: SARDI Head Office and Plant Research Centre; AWRI; ACPFG; CSIRO research laboratories. SARDI also has establishments at Glenside and West Beach. Edinburgh, South Australia: DSTO; BAE Systems (Australia); Lockheed Martin Australia Electronic Systems. Technology Park (Mawson Lakes): BAE Systems; Optus; Raytheon; Topcon; Lockheed Martin Australia Electronic Systems. Research Park at Thebarton: businesses involved in materials engineering, biotechnology, environmental services, information technology, industrial design, laser/optics technology, health products, engineering services, radar systems, telecommunications and petroleum services. Science Park (adjacent to Flinders University): Playford Capital. The Joanna Briggs Institute, a global research collaboration for evidence-based healthcare with its headquarters in North Adelaide. While established as a British province, and very much English in terms of its culture, Adelaide attracted immigrants from other parts of Europe early on, including German and other European non-conformists escaping religious persecution. The first German Lutherans arrived in 1838 bringing with them the vine cuttings that they used to found the acclaimed wineries of the Barossa Valley. Adelaide's arts scene flourished in the 1960s and 1970s with the support of successive premiers from both major political parties. The renowned Adelaide Festival of Arts and Fringe Festival were established in 1960 under Thomas Playford. Construction of the Adelaide Festival Centre began under Steele Hall in 1970 and was completed under the subsequent government of Don Dunstan, who also established the South Australian Film Corporation and, in 1976, the State Opera of South Australia. Over time, the Adelaide Festival has expanded to include the Adelaide Cabaret Festival, Adelaide Film Festival, Adelaide Festival of Ideas, Adelaide Writers' Week, and WOMADelaide, all held predominately in the autumnal month of March (sometimes jocularly called 'mad March' by locals due to the hectic clustering of these events). Other festivals include FEAST (a queer culture celebration), Tasting Australia (a biennial food and wine affair), and the Royal Adelaide Show (an annual agricultural show and state fair). The Adelaide Convention Centre, the first of its kind in South Australia, is situated on the River Torrens. Photo taken in 2007. There are many international cultural fairs, most notably the German Schützenfest and Greek Glendi. Adelaide is home to the Adelaide Christmas Pageant, the world's largest Christmas parade. As the state capital, Adelaide is home to a great number of cultural institutions with many along the boulevard of North Terrace. The Art Gallery of South Australia, with around 35,000 works, holds Australia's second largest state-based collection. Adjacent are the South Australian Museum and State Library of South Australia, while the Adelaide Botanic Garden, National Wine Centre and Tandanya National Aboriginal Cultural Institute are nearby in the East End of the city. In the back of the State Library lies the Migration Museum, Australia's oldest museum of its kind. Contemporary art scenes include the Contemporary Art Centre of South Australia. Adelaide Festival Centre, on the banks of the Torrens, is the focal point for much of the cultural activity in the city and home to the State Theatre Company of South Australia, with other venues including the Adelaide Entertainment Centre and the city's many smaller theatres, pubs and cabaret bars. The music of Adelaide has produced musical groups and individuals who have achieved national and international fame. This includes the Adelaide Symphony Orchestra, the Adelaide Youth Orchestra, rock bands The Angels, Cold Chisel, The Superjesus, Wolf & Cub, roots/blues group The Audreys, internationally acclaimed metal acts I Killed The Prom Queen and Double Dragon, popular Australian hip-hop outfit Hilltop Hoods, pop acts like Sia, Orianthi, Guy Sebastian, and Wes Carr, as well as internationally successful tribute act, The Australian Pink Floyd Show. Adelaide plays host to two of Australia's leading contemporary dance companies. The Australian Dance Theatre and Leigh Warren & Dancers contribute to state festivals and perform nationally and internationally. Restless Dance Theatre is also based in Adelaide and is nationally recognised for working with disabled and non-disabled dancers to use movement as a means of expression. Adelaide has been recognised as a "City of Music" by the UNESCO Creative Cities Network. In 2014, Ghil'ad Zuckermann founded the Adelaide Language Festival. Adelaide pop-concert venues (past and present) include Adelaide Entertainment Centre; Adelaide Festival Theatre; Adelaide Oval; Apollo Stadium; Memorial Drive Park; Thebarton Theatre. Other concert and live theatre venues include Adelaide Town Hall; Dunstan Playhouse; Her Majesty's Theatre. Sir Keith Murdoch House, named after the founder of The News, is the headquarters for the publisher of Adelaide's daily newspaper, The Advertiser. Newspapers in Adelaide are dominated by News Corporation publications—Adelaide being the birthplace of News Corporation itself. The only South Australian daily newspaper is The Advertiser, published by News Corporation six days a week. The same group publishes a Sunday paper, the Sunday Mail. There are eleven suburban community newspapers published weekly, known collectively as the Messenger Newspapers, also published by a subsidiary of News Corporation. The Independent Weekly was a small independent newspaper providing an alternative view, but ceased publishing its print edition in November 2010 and now exists as a digital daily newsletter only. The Adelaide Review is a free paper published fortnightly, and other independent magazine-style papers are published, but are not as widely available. All of the five Australian national television networks broadcast both high-definition digital and standard-definition television digital services in Adelaide. They share three transmission towers on the ridge near the summit of Mount Lofty. Two other transmission sites are located at Grenfell Street and Elizabeth Downs. The two government-funded stations are run by the Australian Broadcasting Corporation (ABC South Australia) and the Special Broadcasting Service (SBS). The Seven Network and Network Ten both own their Adelaide stations (SAS-7 and ADS-10 respectively). Adelaide's NWS-9 is part of the Nine Network. New channels available in addition to ABC, Seven, Nine, Ten and SBS include Ten HD, (Channel Ten broadcast in HD), One, Eleven, TVSN, Spree TV, ABC2/KIDS, ABC3, ABC News, SBS HD (SBS broadcast in HD), SBS2, Food Network, NITV, 7HD (Channel 7 broadcast in HD), 7Two, 7mate, 7flix, TV4ME, RACING.COM, 9HD (Channel Nine broadcast in HD), 9Gem, 9Go!, 9Life and eXtra. Adelaide also has a community television station, Channel 44. The Foxtel pay TV service is available as cable television in a few areas, and as satellite television to the entire metropolitan area. It is resold by a number of other brands, mostly telephone companies. As part of a nationwide phase-out of analogue television in Australia, Adelaide's analogue television service was shut down on 2 April 2013. There are 20 radio stations that serve the metropolitan area, as well as four community stations that serve only parts of the metropolitan area. Of the 20 full-coverage stations, there are six commercial stations, six community stations, six national stations and two narrowcast stations. The recent commencement of digital audio broadcasting (DAB) has seen the introduction of an additional 23 radio stations, some of which are duplications of existing AM and FM stations. A complete list can be found at List of radio stations in Australia#Adelaide. AM Band: Cruise 1323, FIVEaa 1395 SEN SA 1629. Adelaide Oval is the home of Australian Rules football and cricket in South Australia. Hindmarsh Stadium hosts Adelaide United. Titanium Security Arena is home to basketball in South Australia. The main sports played professionally in Adelaide are Australian Rules football, association football (soccer), cricket, netball, and basketball. Adelaide is the home of two Australian Football League teams: the Adelaide Football Club and Port Adelaide Football Club, and one A-League soccer team, Adelaide United. A local Australian rules football league, the SANFL, is made up of 10 teams from around Adelaide. The SANFL has been in operation since 1877 when it began as the South Australian Football Association (SAFL) before changing its name to the SANFL in 1927. The SANFL is the oldest surviving football league of any code played in Australia. Adelaide has developed a strong culture of attracting crowds to major sporting events. 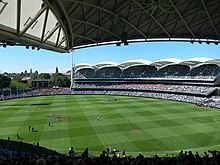 Until the completion of the 2012–14 renovation and upgrade of the Adelaide Oval, most large sporting events took place at either AAMI Stadium (the then home base of the Adelaide Crows, and the then Port Adelaide's home game venue), or the historic Adelaide Oval, home of the Southern Redbacks and the Adelaide Strikers cricket teams. Since completion of the upgrade, home games for Adelaide Crows and Port Adelaide now take place at Adelaide Oval. Since 1884, Adelaide Oval has also hosted an international cricket test every summer, along with a number of One Day International cricket matches. Memorial Drive Park, adjacent to the Adelaide Oval, used to host Davis Cup and other major tennis events, including the Australian Open and (until 2009) the Adelaide International (now known as the Brisbane International). Adelaide's professional association football team, Adelaide United, play in the A-League. Founded in 2003, their home ground is Hindmarsh Stadium, which has a capacity of 17,000 and is one of the few purpose-built soccer stadia in Australia. Prior to United's foundation, Adelaide City and West Adelaide represented the city in the National Soccer League. The two sides, which contest the Adelaide derby against one another, now play in the National Premier Leagues South Australia. For two years, 1997 and 1998, Adelaide was represented in Australia's top level rugby league, after the New South Wales Rugby League had played a single game per season at the Adelaide Oval for five years starting in 1991. The Adelaide Rams were formed and played in the breakaway Super League (SL) competition in 1997 before moving to the new National Rugby League in 1998. Initially playing at the Adelaide Oval, the club moved to the more suitable Hindmarsh Stadium late in the 1998 season. As part of a peace deal with the Australian Rugby League to end the Super League war, the club's owners News Limited (who were also owners of the SL) suddenly closed the club only weeks before the start of the 1999 season. Adelaide has two professional basketball teams, the men's team being the Adelaide 36ers which plays in the National Basketball League (NBL) and the women's team, the Adelaide Lightning which plays in the Women's National Basketball League (WNBL). Both teams play their home games at the Titanium Security Arena. Adelaide has a professional netball team, the Adelaide Thunderbirds, which plays in the national netball competition, the Suncorp Super Netball championship, with home games played at Priceline Stadium. The Thunderbirds occasionally play games or finals at the Titanium Security Arena, while international netball matches are usually played at the 10,500 seat Adelaide Entertainment Centre. The Titanium Security Arena has a capacity of 8,000 and is the largest purpose-built basketball stadium in Australia. The Tour Down Under is the first event of the UCI World Tour calendar. Since 1999 Adelaide and its surrounding areas have hosted the Tour Down Under bicycle race, organised and directed by Adelaide-based Mike Turtur. Turtur won an Olympic gold medal for Australia in the 4000m Team pursuit at the 1984 Los Angeles Olympics. The Tour Down Under is the largest cycling event outside Europe and was the first event outside Europe to be granted UCI ProTour status. Adelaide maintains a franchise in the Australian Baseball League, the Adelaide Bite. They have been playing since 2009, and their home stadium (until 2016) was Norwood Oval. From 2016 the team moved to the Diamond Sports Stadium located near the Adelaide International Airport due to renovations at Norwood. Its name stems from the local Great Australian Bight, and from the abundance of local Great White Sharks. Adelaide also has an Ice Hockey team, Adelaide Adrenaline in the Australian Ice Hockey League (AIHL). It was national champions in 2009 and plays its games at the IceArenA. The Australian Grand Prix for World Championship Formula One racing was hosted by Adelaide from 1985 to 1995 on the Adelaide Street Circuit which was laid out in the city's East End as well as the eastern parklands including the Victoria Park Racecourse. The Grand Prix became a source of pride, and losing the event to Melbourne in a surprise announcement in mid-1993 left a void that has since been filled with the highly successful Clipsal 500 for V8 Supercar racing, held on a modified version of the same street circuit. The Classic Adelaide, a rally of classic sporting vehicles, is also held in the city and its surrounds. Adelaide formerly had three horse racing venues. Victoria Park, Cheltenham Park Racecourse, both of which have now closed, and Morphettville Racecourse that remains the home of the South Australian Jockey Club. It also has Globe Derby Park for Harness racing that opened in 1969, and by 1973 had become Adelaide's premier harness racing venue taking over from the Wayville Showgrounds, as well as Greyhound Park for greyhound racing that opened in 1972. The World Solar Challenge race attracts teams from around the world, most of which are fielded by universities or corporations, although some are fielded by high schools. The race has a 20-years' history spanning nine races, with the inaugural event taking place in 1987. Adelaide hosted the 2012 World Bowls Championships at Lockleys Bowling Club, becoming the third city in the world to have held the championships twice, having previously hosted the event in 1996. Dirt track speedway is also popular in Adelaide with three operating speedways. Adelaide Motorsport Park, located adjacent to the Adelaide International Raceway road racing circuit at Virginia (24 km (15 mi) north of the city centre) has been in continuous operation since 1979 after the closure of the popular Rowley Park Speedway. Gillman Speedway located in the semi-industrial suburb of Gillman, has been in operation since 1998 and caters to Motorcycle speedway and Sidecars, while the Sidewinders Speedway located in Wingfield is also a motorcycle speedway dedicated to Under-16 riders and has been in operation since 1978. In 2016 backed my South Australia's Peregrine Group owners of OTR (On the run service stations and 24/7 hour convienent stores) opened up a multi-purpose facility; a state-of-the-art motorsporting park and a hotel alongside its newer OTR service station outside a small township of Tailem Bend currently named The Bend Motorsport Park. Design for thrill seekers and rev-heads the facility currently host South Australia's second V8 Supercars motoring event during a round in August and hopes to bring in other major international motoring events such as SBK Superbikes and other well established FIA motoring events. Adelaide is home to the Great Southern Slam, the world's largest roller derby tournament. The tournament has been held biennially over Australia's Queen's Birthday holiday weekend since 2010. In 2014 and 2016 the tournament featured 45 teams playing in two divisions. In 2018 the tournament has expanded to 48 teams competing in three divisions. Adelaide's two largest tertiary hospitals in the city are the Royal Adelaide Hospital (RAH), a teaching hospital of the University of Adelaide (705 beds), and the Flinders Medical Centre (580 beds) in Bedford Park, a teaching hospital of Flinders University. Other major public hospitals in the Adelaide area are the Women's and Children's Hospital (305 beds), on King William Road in North Adelaide; the Queen Elizabeth Hospital (340 beds) in Woodville and the Lyell McEwin Hospital (198 beds) in Elizabeth. These hospitals are all teaching hospitals. Additional RAH campuses which specialise in specific patient services are in the suburbs of Adelaide – the Hampstead Rehabilitation Centre in Northfield, and the Glenside Campus Mental Health Service. Adelaide also hosts numerous private hospitals in the city centre and suburbs. In June 2007 the State Government announced a series of overhauls to the health sector that would see a new hospital constructed on railyards at the west end of the city, to replace the Royal Adelaide Hospital at the east end of the city. The new 800-bed hospital has a cost of A$1.85 billion and was planned to be named the "Marjorie Jackson-Nelson Hospital" after the former Governor of South Australia. However, in 2009, at the former governor's request, the state government chose to drop this name and instead transfer the Royal Adelaide Hospital name to the proposed facility. Construction started in June 2011 and finished in 2017. In addition, major upgrades were announced to see the Flinders Medical Centre become the primary centre for health care for the southern suburbs, and the Lyell McEwin Hospital in Elizabeth become the centre for the northern suburbs. The trio of the Queen Elizabeth Hospital, the Modbury Hospital and the Noarlunga Hospital were to become specialist elective surgery centres. The Repatriation General Hospital was also to expand its range of speciality areas beyond veterans' health to incorporate stroke, orthopaedic rehabilitation and aged care. With the "Global Financial Crisis" of 2008, it remains to be seen if and how these initiatives will proceed. The largest not-for-profit provider of community health care within Adelaide is the Royal District Nursing Service (South Australia) which provides out of hospital care and hospital avoidance care, easing pressure on the South Australia public hospital system. 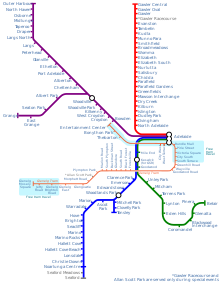 A map of Adelaide's railway and tram network, served by the Adelaide Metro. Being centrally located on the Australian mainland, Adelaide forms a strategic transport hub for east-west and north-south routes. The city itself has a metropolitan-wide public transport system, which is managed by and known as the Adelaide Metro. The Adelaide Metro consists of a contracted bus system including the O-Bahn Busway, metropolitan railways (with diesel and electric lines), and the Adelaide-Glenelg Tram, which was extended as a metropolitan tram in 2010 through the city centre to the inner north-west suburb of Hindmarsh. There are further plans to extend the tram to Port Adelaide and Semaphore. A CBD tram loop too, is being considered and the latest Adelaide Airport master plan has also revealed a tram extension to the airport in the near future. Road transport in Adelaide has historically been comparatively easier than many of the other Australian cities, with a well-defined city layout and wide multiple-lane roads from the beginning of its development. 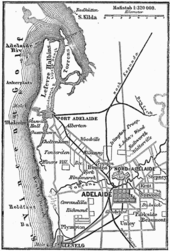 Historically, Adelaide was known as a "twenty-minute city", with commuters having been able to travel from metropolitan outskirts to the city proper in roughly twenty minutes. However, these roads are now often considered inadequate to cope with Adelaide's growing road traffic, and often experience traffic congestion. The South Eastern Freeway (M1), connects the south-east corner of the Adelaide Plain to the Adelaide Hills and beyond to Murray Bridge and Tailem Bend, where it then continues as National Highway 1 south-east to Melbourne. The Southern Expressway (M2), connecting the outer southern suburbs with the inner southern suburbs and the city centre. It duplicates the route of South Road. The North-South Motorway (M2), is an ongoing major project that will become the major north-south corridor, replacing most of what is now South Road, connecting the Southern Expressway and the Northern Expressway via an expressway with no traffic lights. Currently, the motorway runs as an elevated freeway from its junction with the Port River Expressway to Regency Road, in Adelaide's inner north-west. Continuation of the motorway is currently under construction in form of the Northern Connector project, the Darlington Upgrade project and the Torrens Road to River Torrens project. The Port River Expressway (A9), connects Port Adelaide and Outer Harbor to Port Wakefield Road at the northern "entrance" to the metropolitan area. The Northern Expressway (Max Fatchen Expressway) (M20), is the northern suburbs bypass route connecting the Sturt Highway (National Highway 20) via the Gawler Bypass to Port Wakefield Road at a point a few kilometres north of the Port River Expressway connection. The Northern Connector (proposed route M20) commenced construction in 2016, to connect the North-South Motorway with the Northern Expressway. The road will not be subject to direct tolls, but South Australia will become a testing ground for a "network fee" that involves charging trucks based on road use and impact in place of high registration fees. A Qantas plane leaving Adelaide Airport. The Adelaide metropolitan area has two commercial airports, Adelaide Airport and Parafield Airport. Adelaide Airport, in Adelaide's western suburbs, serves in excess of 8 million passengers annually. Parafield Airport, Adelaide's second airport 18 kilometres (11 miles) north of the city centre, is used for small aircraft, pilot training and recreational aviation purposes. Parafield Airport served as Adelaide's main aerodrome until the opening of the Adelaide Airport in February 1955. Adelaide airport serves 9 international destinations and all state capital cities. Adelaide's energy requirements were originally met by the Adelaide Electric Supply Company, which was nationalised by the Playford government in 1946, becoming the Electricity Trust of South Australia (ETSA), now known as SA Power Networks. Despite significant public opposition and the Labor party's anti-privatisation stance which left the Liberal party one vote short of the numbers needed to pass the legislation, ETSA was privatised by the Olsen Government in 1999 by way of a 200-year lease for the distribution network and the outright purchase of ETSA Power by the Cheung Kong Holdings for $3.5 billion (11 times ETSA's annual earnings) after Labor MP Trevor Crothers resigned from the party and voted with the government. The electricity retail market was opened to competition in 2003 and although competition was expected to result in lower retail costs, prices increased by 23.7% in the market's first year. In 2004 the privatisation was deemed to be a failure with consumers paying 60% more for their power and with the state government estimated to lose $3 billion in power generation net income in the first ten years of privatisation. In 2012, the industry came under scrutiny for allegedly reducing supply by shutting down generators during periods of peak demand to force prices up. Increased media attention also revealed that in 2009 the state government had approved a 46% increase in retail prices to cover expected increases in the costs of generation while generation costs had in fact fallen 35% by 2012. These price increases and large subsidies have led to South Australia paying the highest retail price for electricity in the country. SA Power Networks now distributes electricity from transmission companies to end users. Privatisation led to competition from a variety of companies who now separately provide for the generation, transmission, distribution and retail sales of gas and electricity. Some of the major companies are: TRUenergy, which generates electricity; ElectraNet, which transmits electricity from the generators to the distribution network, Lumo Energy and AGL Energy, which retails gas and electricity. Substantial investment has been made in maintenance and reinforcement of the electricity supply network to provide continued reliability of supply. Adelaide derives most of its electricity from the Torrens Island Power Station gas-fired plant operated by AGL Energy and the Pelican Point Power Station, along with wind power and connections to the national grid. Gas is supplied from the Moomba Gas Processing Plant in the Cooper Basin via the Moomba Adelaide Pipeline System and the SEAGas pipeline from Victoria. South Australia generates 18% of its electricity from wind power, and has 51% of the installed capacity of wind generators in Australia. Adelaide's water supply is gained from its reservoirs: Mount Bold, Happy Valley, Myponga, Millbrook, Hope Valley, Little Para and South Para. The yield from these reservoir catchments can be as little as 10% of the city's requirements in drought years and about 60% in average years. The remaining demand is met by the pumping of water from the River Murray. A sea water desalination plant capable of supplying half of Adelaide's water requirements (100GL per annum) was commissioned in 2013. The provision of water services is by the government-owned SA Water. ^ a b c "33218.0 - Regional Population Growth, Australia, 2016-17". Australian Bureau of Statistics. 24 April 2018. Retrieved 24 April 2018. ^ "2011 Census Community Profiles, Code 4GADE (GCCSA)". Australian Bureau of Statistics. Retrieved 28 February 2015. ^ "Great Circle Distance between ADELAIDE and MELBOURNE". Geoscience Australia. March 2004. ^ "Great Circle Distance between ADELAIDE and CANBERRA". Geoscience Australia. March 2004. ^ "Great Circle Distance between ADELAIDE and SYDNEY". Geoscience Australia. March 2004. ^ "Great Circle Distance between ADELAIDE and Brisbane". Geoscience Australia. March 2004. ^ "Great Circle Distance between ADELAIDE and Perth". Geoscience Australia. March 2004. ^ Macquarie ABC Dictionary. The Macquarie Library Pty Ltd. 2003. p. 10. ISBN 1-876429-37-2. ^ A History of the Faculty of Arts at the University of Adelaide 1876-2012. University of Adelaide Press. 2012. p. 245. ISBN 978-1-92206436-3. ^ Troy, Patrick (2000). A History of European Housing in Australia. Cambridge University Press. p. 188. ISBN 978-0-521-77733-9. ^ "Progressive Adelaide". BBC. Retrieved 26 January 2017. ^ Religion: Diversity Archived 10 August 2013 at the Wayback Machine, SA Memory. Retrieved on 23 December 2010. ^ "Liveability rankings". The Economist. ^ "404". Archived from the original on 24 July 2012. ^ "Liveability ranking". The Economist. ^ "Daily chart". The Economist. ^ "Adelaide crowned nation's most livable city". ABC News Online. Australian Broadcasting Corporation. 22 January 2011. Retrieved 23 January 2011. ^ "Adelaide voted nation's most liveable". AdelaideNow. 25 March 2012. Retrieved 2 July 2012. ^ "Adelaide the country's most liveable city". The Sydney Morning Herald. 4 March 2013. Retrieved 4 March 2013. ^ Amery, Rob (2000). Warrabarna Kaurna! – Reclaiming an Australian Language. The Netherlands: Swets & Zeitlinger. ISBN 90-265-1633-9. ^ "City of Holdfast Bay – Proclamation Day". Archived from the original on 13 July 2012. ^ Johnson and Langmead, The Adelaide city plan: fiction and fact, Wakefield Press, 1986. ^ Wakefield, Letter from Sydney, December 1829, pp. 99–185, written from Newgate prison. Editor Robert Gouger. ^ Wakefield wrote about this under a pseudonym, purporting to be an Australian settler. His subterfuge was so successful that he confused later writers, including Karl Marx, who wrote "It is the great merit of E.G. Wakefield to have discovered not anything new about the Colonies, but to have discovered in the Colonies the truth of as to the condition of capitalist production in the mother-country.' Das Kapital, Moscow, 1958, p 766"
^ Plan of a Company to be Established for the Purpose of Founding a Colony in Southern Australia, Purchasing Land Therein, and Preparing the Land so Purchased for the Reception of Immigrants, 1832; in Wakefield, Edward Gibbon, Prichard, M. F., (ed.) The Collected Works of Edward Gibbon Wakefield, Collins, London, 1968, p 290. ^ "Free Settlement". History of Adelaide Gaol. Environment.sa.gov.au. Archived from the original on 24 October 2009. Retrieved 7 September 2010. ^ "Gaol Founders". History of Adelaide Gaol. Environment.sa.gov.au. Archived from the original on 25 October 2009. Retrieved 14 August 2012. ^ "Light's Vision". History of Adelaide Gaol. Environment.sa.gov.au. Archived from the original on 25 October 2009. Retrieved 7 September 2010. ^ Blair, Robert D. (2001). "Events in South Australian History 1834–1857". Pioneer Association of South Australia. Retrieved 10 May 2006. ^ When Chrysler stopped manufacturing in Adelaide, Mitsubishi Motors Australia Limited took over the Tonsley Park factory. After many years of mixed fortunes, Mitsubishi ceased manufacturing at Tonsley Park on 27 March 2008. ^ a b "Adelaide Street Circuit". Formula 1 Database. Archived from the original on 11 October 2007. Retrieved 13 June 2007. ^ "All-round country". The Australian. 29 September 2004. p. 14. ^ "Council on Tall Buildings and Urban Habitat database". Retrieved 11 December 2018. ^ The Adelaide Metropolitan Coastline Coastline, South Australian Coastal Protection Board, No. 27, April 1993. Retrieved 6 December 2015. ^ C. Kerr-Grant (1955): The Adelaide Earthquake of 1 March 1954 (PDF). South Australian Museum, 10 November 1955. Retrieved 5 April 2009. ^ Adelaide, SA: Earthquake. EMA Disasters Database. Emergency Management Australia, 13 September 2006. Retrieved 5 April 2009. ^ Adelaide hit by earth tremor ABC News, 17 April 2010. Retrieved 12 April 2018. ^ Shallow earthquake jolts Adelaide awake ABC News, 20 October 2011. Retrieved 12 April 2018. ^ Adelaide shaken by earth tremor which sounded like 'jet taking off' ABC News, 6 January 2014. Retrieved 12 April 2018. ^ Tremor shakes Adelaide nine days after larger earthquake in city ABC News, 10 February 2017. Retrieved 12 April 2018. ^ Adelaide's Inner and Outer Ring Routes Archived 6 March 2014 at the Wayback Machine, 24 August 2004, South Australian Department of Transport. ^ "Adelaide's Freeways – A History from MATS to the Port River Expressway". Ozroads. ^ "Clipsal site at Bowden to become a green village", Ministerial Press Release, 24 October 2008, SA Govt. Retrieved 20 November 2008. ^ "Government reveals Clipsal site purchase price", Ministerial Press Release, 15 November 2008, SA Govt, archived. Retrieved 27 November 2018. ^ What's a 'cold monsoon'? And is it the best way to describe Adelaide's climate? ABC News, 3 May 2018. Retrieved 30 May 2018. ^ Copyright Global Sea Temperatures – A-Connect Ltd. "Glenelg Sea Temperature | Australia Water Temperatures". 34.983330;138.516670: Seatemperature.org. Retrieved 20 September 2017. ^ "Climate statistics for ADELAIDE (KENT TOWN)". Climate statistics for Australian locations. Bureau of Meteorology. Retrieved 18 June 2017. ^ "Lowest Temperature - 023090". Bureau of Meteorology. Retrieved 18 June 2017. ^ "Highest Temperature - 023090". Bureau of Meteorology. Retrieved 18 June 2017. ^ "Climate Statistics for Adelaide Airport (1955-2012)". Retrieved 24 February 2014. ^ "Capital City Committee". Government of South Australia and Adelaide City Council. October 2008. Archived from the original on 18 June 2009. Retrieved 20 June 2009. ^ 3218.0 – Regional Population Growth, Australia, 2013–14 Archived 20 February 2016 at the Wayback Machine SOUTH AUSTRALIA STATE SUMMARY Australian Bureau of Statistice, 31 March 2015. Retrieved 11 February 2016. ^ a b c "Population Of Adelaide In 2016,". Australiapopulation2016.com. 13 January 2016. Retrieved 20 September 2017. ^ "Religion: Diversity". Archived from the original on 10 August 2013. Retrieved 15 November 2013. ^ "Religious freedom". Archived from the original on 9 March 2014. Retrieved 15 November 2013. ^ "2011 Census – Greater Adelaide". ^ a b Adelaide, Jewish Virtual Library, Encyclopaedia Judica, 2008. ^ "The Jewish Community of Adelaide". Beit Hatfutsot Open Databases Project. The Museum of the Jewish People at Beit Hatfutsot. ^ Westrip, J.; Holroyde, P. (2010). Colonial Cousins: a surprising history of connections between India and Australia. Wakefield Press. Kent Town, South Australia. ISBN 978-1-86254-841-1. OL 24582860M. ^ a b c d "1345.4 – SA Stats, June 2011". ^ a b "Health now our biggest employer – Adelaide Now". ^ a b 1345.4 – SA Stats, Apr 2011. Abs.gov.au. Retrieved on 26 July 2013. ^ Visualised: How Defence dominates govt tenders in SA InDaily, 28 August 2013. Retrieved 11 January 2016. ^ South Australia: The Defence Industry Choice, Defence SA. ^ "Workforce Wizard | WorkReady – Skills and Employment". Skills.sa.gov.au. 14 September 2017. Retrieved 20 September 2017. ^ Australian Bureau of Statistics (25 October 2007). "Adelaide (Statistical Division)". 2006 Census QuickStats. Retrieved 28 February 2008. ^ Adelaide Archived 4 September 2007 at the Wayback Machine, Labour Market Information Portal. ^ SA Regional Labour Force Data Archived 19 June 2007 at the Wayback Machine, April 2007, Australian Bureau of Statistics Labour Force Survey. ^ "State and Metro Adelaide Historical Median House Prices". www.reisa.com.au. ^ "SA house prices surge ahead" (PDF). wic003lc.server-web.com. Archived from the original on 4 July 2010. ^ a b Australia, Government of South. "Median house sales by quarter". www.sa.gov.au. Retrieved 21 June 2017. ^ "Public Information – REISA". ^ Edwards, Verity (3 May 2008). "Education attracts record numbers". The Weekend Australian. ^ Broadstock, Amelia (6 May 2015). "International Uni student numbers a billion dollar boom for Adelaide". The City Messenger. ^ Hodges, Lucy (29 May 2008). "Brave new territory: University College London to open a branch in Australia". The Independent (UK). ^ "About Heinz Australia: Carnegie Mellon Heinz College". Carnegie Mellon University. Archived from the original on 10 April 2011. ^ The historic Torrens Building in Victoria Square was beautifully restored at (considerable) taxpayer expense not long before SA Premier Mike Rann announced that it would be used as the core of Adelaide's international university precinct. ^ "Carnegie Mellon University". GoingToUni.gov.au. Government of South Australia. Archived from the original on 23 November 2011. ^ "Facts & Figures". University of Adelaide. Archived from the original on 21 July 2011. Retrieved 1 June 2012. ^ "Facts about UniSA". University of South Australia. Retrieved 1 June 2012. ^ Student and staff numbers, 2016 Flinders University, 21 July 2017. Retrieved 26 February 2018. ^ The Plaza and Student Hub, Flinders University, 24 November 2017. Retrieved 26 February 2018. ^ Edwards, Verity (3 May 2008). "RI Australia plugs into world science". The Weekend Australian. ^ author. "Livestock – Glenside Laboratories". ^ "A great of the SA science world". www.adelaidenow.com.au. 24 May 2012. ^ "Adelaide | Creative Cities Network". en.unesco.org. Retrieved 4 September 2016. ^ "Adelaide Language Festival 2014". Archived from the original on 10 March 2015. ^ "Adelaide Language Festival, 2017". Archived from the original on 9 September 2017. ^ "Digital television reception in Craigmore/Hillbank" (PDF). Australian Government. Archived from the original (PDF) on 5 May 2013. Retrieved 29 April 2013. ^ "mySwitch". Archived from the original on 5 July 2014. ^ "World Radio Map - Adelaide". ^ "Australian sport owes much to little old Adelaide". ^ "adelaideadrenaline.com.au". Adelaide Adrenaline 2014. ^ Owen, Michael (7 June 2007). "800 beds, helipad and train station: Our 'Marj' hospital". The Advertiser. p. 5. ^ "A look at 'Technical Completion' and…". Royal Adelaide Hospital. 3 January 2019. ^ "'News: New $1.7 billion hospital spearheads health reform'". Ministers.sa.gov.au. 6 June 2007. Archived from the original on 15 August 2009. Retrieved 7 September 2010. ^ "Master Plan – Adelaide Airport" (PDF). adelaideairport.com.au. Archived from the original (PDF) on 19 February 2011. ^ "Adelaide Airport reaches 8 million passengers in 2016" (PDF). Adelaide Airport Ltd. media release. 16 January 2017. Retrieved 23 April 2017. ^ P.A. Howell. "Biography – Sir Charles Willoughby Moke Norrie". Australian Dictionary of Biography. Retrieved 16 June 2012. ^ Shock Labor "betrayal" allows SA Govt to effectively privatise power utility 7.30 Report, ABC, 3 June 1999. Archived copy. Retrieved 20 September 2017. ^ "Power crisis 'as bad as California'". Archived from the original on 1 May 2013. ^ "Privatisation 'will cost state billions'". Archived from the original on 2 May 2013. ^ Dylan McConnell; David Blowers (13 March 2018). "FactCheck: does South Australia have the 'highest energy prices' in the nation and 'the least reliable grid'?". The Conversation. Retrieved 9 July 2018. ^ "Industry structure". Department for Transport, Energy and Infrastructure. Archived from the original on 24 June 2005. Retrieved 5 May 2006. ^ "Supply Security". Department for Transport, Energy and Infrastructure. Archived from the original on 24 June 2005. Retrieved 5 May 2006. Kathryn Gargett; Susan Marsden, Adelaide: A Brief History. Adelaide: State History Centre, History Trust of South Australia in association with Adelaide City Council, 1996 ISBN 978-0-7308-0116-0. Susan Marsden; Paul Stark; Patricia Sumerling, eds., Heritage of the City of Adelaide: an illustrated guide. Adelaide: Adelaide City Council, 1990, 1996. ISBN 978-0-909866-30-3. Derek Whitelock et al. Adelaide: a sense of difference. Melbourne: Arcadia, 2000. ISBN 978-0-87560-657-6.